Powers tells the story of his family in No One Cares About Crazy People. He is married to Honoree and they had 2 boys, Dean and Kevin. Both boys were talented musicians, but both developed major mental illness, and Kevin killed himself when he was 20. So this is a deeply sad and troubling book. But it is also a book full of love and fond memories of the youth of the boys. Powers is a literature professor and he has published many books previously, so he brings the skills of a practiced writer to this memoir. He and his wife started living in New York City, but they moved to Middlebury, Vermont when a job opportunity came up there, and they have lived there since the boys were very young. They grew up in a community they really enjoyed and felt accepted most of the time. Things started to become more difficult when Dean turned 16 and got into a car accident while driving a friend, leading her to be seriously hurt. The resulting publicity caused some bad feeling and made life more difficult for the family. As the boys got closer to their twenties, their symptoms developed and became more serious. It took some time for Powers and his wife to come to grips with the seriousness of the situation, and to work out the best response. The boys received psychiatric treatment but were not always cooperative and both had several emergencies. But they also had great successes in their lives, graduating from high school and going to college, and most of all, working on their guitar playing. Many of the chapters depicting the boys' early life and even their successes in their teens are full of detail about the community and are full of Powers' pride in being a father. It's a remarkable memoir for the power of the language. The unabridged audiobook is read by Powers himself, and this is an instance where it makes a huge difference to have the author perform the book. He is a practiced performer, providing his prose with plenty of feeling, maybe to the extent of hamming it up occasionally. A few times, there are also recordings of the boys playing music in the background, and this is especially affecting. The other side of this book is a discussion of the history of psychiatry and theories of schizophrenia and schizoaffective disorder, of debates about the status of psychiatry, and of the way that society treats mentally ill people. This material is mostly familiar from many other sources -- the theories of Kraepelin and Bleuler, and more modern approaches, the early history of asylums and mental hospitals, and the current state of mental health policy. Powers has many stories of mentally ill people being killed by police and no one ever being prosecuted for such killings. His main theme is that the history and current policy has largely failed people with mental illnesses. Some approaches are well-meaning, and some are just cruel. All too often, people with mental illness are taken to not matter, and no one cares. His case is more anecdotal than watertight but he makes a plausible case. Even with material that is familiar, Powers manages to make it interesting by his vivid descriptions and inclusion of details that are more unusual. Powers also includes theoretical perspectives that are more unusual. He has a brief discussion of shamanism, for example, and while he does not believe in it, he is still drawn to the figure of the shaman. He has a short discussion of Julian Jayne's theory of the bicameral mind, and again he sees the attraction even though he knows there's no empirical evidence for the idea. Probably the most original part of the book is Powers' survey of different views is his criticism of the work of Thomas Szasz. He spends some time setting out Szasz's ideas about mental illness being a myth, and he shows how the arguments for this are confused -- all very familiar. But he also sets out how Szasz captured a cultural moment in the 1960s and 1970s and managed to have a surprising amount of influence. This was also due to Szasz's readiness to collaborate with other anti-psychiatry figures. Most damning is his joining forces with L. Ron Hubbard, the charlatan founder of Scientology. He makes it clear how this pressure, combined with politicians wanting to cut costs, helped to reduce services to the mentally ill. This was fine with Szasz, whose libertarian approach entailed that people suffering should be left to sink or swim on their own, dependent on their ability to pay for help on their own. Powers' discussion reminds us that Szasz's approach was not just theoretical, but occurred in a particular social context in which it had a lasting damaging effect. 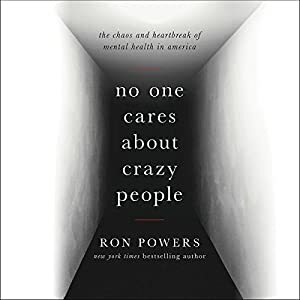 So No One Cares About Crazy People is a powerful book that combines a personal story with a strikingly broad discussion of this history of approaches to mental illness and the current terrible state of treatment. It ends on a more hopeful note, but the general trend of argument is emphasizes how bad things have been and how they have just got worse through most of history. It's one of the best informed and moving books about mental illness published in recent years.